To Ronald Reagan, national security meant battling the Soviet Union for world supremacy. Much more conservative than his predecessors, Reagan argued that international instability of the world could be traced to Moscow and he insisted that the United States needed to use military force to protect its global interests. As a result of these assumptions, the Reagan administration promoted a massive buildup of both conventional and nuclear weapons to close the gap that it presumed had developed between Soviet and American forces. Reagan had little foreign policy expertise. A popular actor who had served as governor of California, he won the presidency from Jimmy Carter in large part because he promised to engineer a return to the glory days of international respect for the U.S. To help achieve this goal, Reagan revamped the national security system. Secretary of State Alexander Haig served as the primary advisor on foreign affairs, while National Security Advisor (NSA) William Clark took responsibility for developing, coordinating, and monitoring national security policy. Reagan made another significant change by terminating the policy of détente with the Soviet Union that had been pursued by his predecessors. He made this choice out of his expressed belief that the inherent evil of Soviet totalitarianism had created an "evil empire." He repeatedly stated the American resolve to fight communist aggression anywhere in the world. This determination would lead the U.S. to confront communism in Grenada, El Salvador, and Nicaragua, with the latter effort turning into the Iran-Contra scandal. Reagan's actions were occasionally more moderate than his words and the administration appeared reluctant to be the first since World War II to fail to arrive at an agreement on arms with the Soviets. President Carter had negotiated the SALT II treaty but Reagan believed that it was fatally flawed. While agreeing to abide by the restrictions of the agreement as long as the Soviet Union did the same, Reagan refused to submit it to the Senate for ratification. In 1982, the administration announced the outlines of a replacement arms control treaty. To show displeasure with past agreements that merely reduced the growth of each side's arsenals instead of reducing the total numbers of weapons, the Reagan administration security team named the new arms control plan START (Strategic Arms Reduction Talks). This new arms policy was designed to bring about cuts in total American and Soviet missiles and warheads, but the two sides were unable to reach an agreement. In 1983, Reagan escalated the nuclear arms race with the Soviet Union by authorizing the Defense Department to develop a Strategic Defense Initiative (SDI). Known to its advocates and critics as "Star Wars," SDI would involve the development of a complex anti-missile defense system employing laser and high-energy particle weapons to destroy enemy missiles in outer space before they reached their targets. By destroying weapons rather than people, SDI would free defense strategy from the concept of mutually assured destruction that had long governed Soviet and American attitudes toward war. Although the system was never built and many scientists doubted that it could ever be constructed in the form proposed, the Soviets felt obligated to keep pace by launching their own SDI-type development program. By the end of Reagan's presidency, his anti-Soviet rhetoric had cooled. Under Mikhail Gorbachev, the Soviets pursued renewed détente and the Reagan administration responded positively. In 1987, the U.S. and U.S.S.R. signed a treaty to eliminate intermediate range (300 to 3,000 miles) nuclear forces (INF). The agreement marked the first time that the two nations had agreed to destroy an entire class of weapons systems. Reagan entered the White House with a campaign promise to refurbish American defense capabilities and to regain military superiority over the Soviet Union. He exited the Oval Office after completing a treaty that served as the first step toward the eventual end of the arms race. By redirecting the thrust of national security policy, the Reagan administration is widely credited with winning the Cold War. 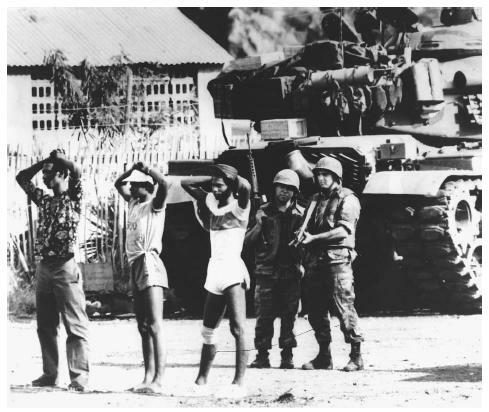 In the shadow of an American M-60 tank, two U.S. soldiers stand guard over three Grenadian prisoners. President Ronald Reagan ordered the invasion of Grenada in 1983 in order to oust its Marxist government. Thomson, Kenneth W., ed. The Reagan Presidency. Lanham, MD: University Press of America, 1997. White House. "History of the National Security Council, 1947–1997." < http://www.whitehouse.gov/nsc/history.html > (April 25, 2003).